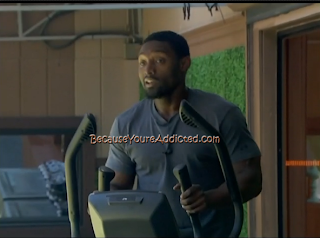 *Judd is not telling Howard/Spencer anything except to get rid of Kaitlin because "she's a strong" competitor. If you remember, Judd is in a fake alliance with Howard/Spencer/GM/Kaitlin. *HG's talked about GinaMarie downing 2 tablespoons of cinamon last night. (Details in the The Overnighter). *Judd thinks Candice is a nice person, but she's annoying. *Andy/Judd know that Howard/Spencer have an alliance with pretty much everyone in the house. *Andy will put up Spencer/Howard if he wins HOH. *Judd's trust in Helen is slipping away, due to him seeing Helen/Jessie talking & when they saw him, Helen walked away. Andy tells him Helen/Jessie are loyal and to not worry about it. *Judd wants to "work on" GM in case she wins HOH. Talk is about getting Howard/Spencer on board with voting Kaitlin out. Judd informs Jessie of his fake alliance with them & how they (H/S) have other alliances with Andy, McCrae/Amanda, and Helen & how H/S doesn't think anyone knows about all their alliances. Talk is about the next HOH comp. Andy: "It can't be Howard/Spencer/Candice. Judd: "Aaryn better not make me regret keeping her." They're talking about telling Howard/Spencer about voting Kaitlin out. Amanda said to tell them on Thursday so that they don't try to change the vote. McCrae has re-joined. Helen left. They talk about how often Howard has been called in the DR. (They think he might be MVP this week.) Amanda comments about how Howard is using his religion in the game. Judd said Spencer's trying to use it now, too. They all agree to nominate H/S if they win HOH. Everyone but Judd/Amanda go inside. Judd talks about how he has to write his HOH blog today. McCrae comes back out & says the HOH is locked so BB might be setting it up for him now. Judd: "F**k! I wanted to take a shower. I'm gonna take a quick one downstairs." Amanda: "Ha! They knew he was gonna take a shower." McCrae tells Amanda about his dream last night. 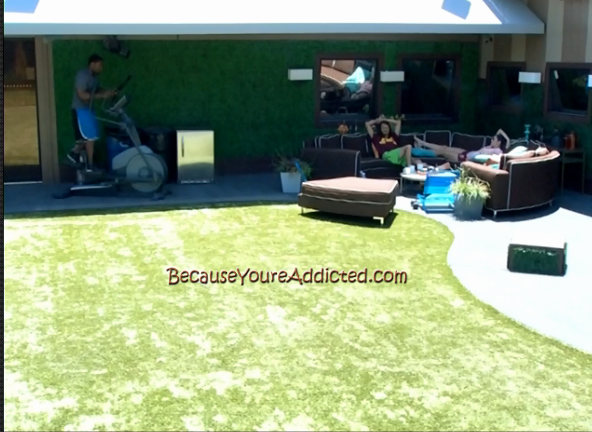 Howard is nearby on the elliptical. Amanda: "I'm gonna grab my bathing suit. I'll grab you're cigarettes." McCrae (to Howard): "What's good?" Spencer is outside now, too. Judd: "I'm just gonna tweet 'Spencer's a motherf***er, Spencer's a motherf***er.."
Howard is talking about truthful with himself (*he's kinda all over the place with whats he saying). He's talking about how people don't think he's smart, but he is but he's not gonna brag. He's "been preparing since day 1 to be smart."...??? Howard: "I know power can switch anytime. It's a battle. At that time, my team will be ready to battle." McCrae: "I haven't heard you being a target, but I heard Amanda is, which scares me." Howard: "You can't hustle a hustler, you can't con a con man. I can see the BS. I know who I got..the thing is, it's hard to hang around (BS) and fake it. Whoever got a good heart, shows." McCrae: "I like your bible a lot.."
Howard: "What, the things at the bottom that explain it?" McCrae: "Yea! That helps a lot!" Howard: "My pastor gave me that bible. I've had it so long." Howard: "Big HOH coming up." Amanda comes out in her bathing suit, with McCrae's cigs in her one hand. They both head to the pool. Amanda: "I wanna lay in the sun." Kaitlin is telling Andy that Helen/Elissa told her (K) that GM is safe this week and that she (K) needs to campaign, which is making her think that she's going home. Kaitlin: "I feel like my days in this are numbered just 'cause of who I was associated with." Andy is totally playing it off. Kaitlin: "Helen/Elissa told me they're worried about Candice & how Howard/Spencer are going around making deals with everybody, which I didn't think was true. I think they're telling me that in case H/S talk to me..."
Andy: "I'll keep my eyes and ears open for you today." If you guys & gals have Time Warner Cable as your provider (like I do), then you need to call 1-888-TW-CABLE and tell them you want them to keep CBS. TWC could drop them as early as next week. This info is per CBS.com. 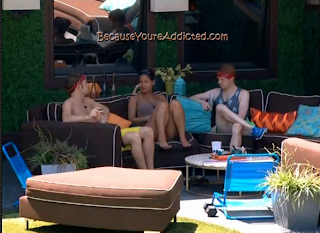 McCrae (in the pool) is talking to Andy (poolside) about non-game stuff. Current topic is Rocky Horror Picture Show. Inside the BB house, Helen/Kaitlin/Candice/Jessie are in the kitchen. Kaitlin: "It becomes a giant clump of clay!" The backyard couch crew are talking about Broadway shows, specifically "Little Shop of Horrors" and the music in it. The girls are talking about Survivor, The Amazing Race, and passports. Judd is finally taking his shower that's been wanting for a couple of hours now. HG's off of HOH lockdown & inside lockdown. This Is One Year Where "Your Word" Means Nothing! Spencer is Howard's only real ally, and vice versa, so it would be interesting to see what would happen to the other with one of them gone. yea i'd love to see Howard/Spencer play without each other. Wow, you really don't know what's going on in the game If you don't have the live feed. Just joined this blog and I love reading it. I always said I wanted to get the livefeed one day. I was rooting for McCrae/Amanda but Amanda seems to be a pushover, and I did like Elissa/Helen but they did seem to think they controlled the game. And Judd is all over the place. I do like Howard's game even though he needs to lose Spencer. And Aaryn has GOT to go. She is a disrespectful brat.. I'm 21 and she makes our generation look like spoiled brats. I don't claim her! haha, love your blog btw!! Steven, it is a "nice rack", money well spent I'd say! Am I the only one that is severely disgusted with Elissas behavior as of late? I mean really, its just nasty. Hey Jamie! Just wanted to say thank you for all you do! I've been following your blog since I think the Donatos were in the house the first time. You do an amazing job and I really appreciate it! I know you've talked about your beautiful dog Bella before and I was just curious as to how she was doing? Thanks again! Hey Jamie, if Time Warner does drop CBS try getting a TV antenna. ABC, NBC and CBS broadcast their channels over the open airwaves. And all the episodes of Big Brother are put on CBS.com usually about 5 to 6 hours after the episode airs on tv. I am a long time reader of you blog and I remember every year during Big Brother it's Miss Bella birthday and you always take her to Petco or Petsmart. She is very lucky to have you as her owner and that you love her so much. Love the blog and thanks for all of the hard work that you put into it for us. Hi Michelle! Thanks for being with me all these years! :D I am just as lucky to have Bella in my life..she's my heart!! I thought the networks switched their broadcast signals over from analog to digital and the rabbit ears don't work anymore? If your TV has a digital tuner (and whose doesn't these days?) all you need is an antenna, if you are reasonably close to the source. If your TV has different inputs, leave your cable or satellite hooked up to one, and connect the antenna to another. You then have to go through the auto tuning rigamarole so your tuner can find the stations. You can't move it around like the good old days or you might have to go through the tuning search again each time you move the antenna. I really don't understand why Amanda wants Howard out sssooo bad! Every one in the house has been dishonest and tried to make a deal with someone to advance his/her game. What is the big deal? Really, one is no better than the other, it is a game of honest/dishonest, truth/lie, strong/weak, etc. I must have missed something with the Am/H. Someone please tell me, "what is the deal with Amanda wanting Howard out"? I must have missed something! Amanda is going through great lengths to get Howard out. Also, everyone there is trying to win the money and they all have lied and crossed one another. So, who is right and who is wrong? You are right Brian. I remember when I had to get a box just to get those broadcast channels because of the kind of tv I had. That was before I got flat screens and dvr's (those were the days). I think it was around 7 to 8 years ago. I guess we'd have to watch BB online. However, TVGN broadcasts after dark, and they just started airing "catch up episodes" on Fridays. You'd have to wait for it, but it would still be aired. It is because Howard and Spencer have been trying to evict Amanda since day one. Anytime they are asked who they want to send home, Amanda's name ALWAYS comes up. Hi Jamie! I've been reading your BB blogs since season 9, and just wanted to give you a GIANT thank you for all the time you spend on keeping us "in-the-know"; I honestly live for summertime to watch this game, and you make the experience so much more FABulous!! as much I have I have been rooting for McCrae (and I love the showmance with Amanda) I'm starting to feel like he's not really playing the game anymore. I think he knows that she has a bigger target on her head between the two so he's not in real danger. it would be interesting to see if McCrae left who would Amanda befriend? She grabbed on to him EARLY in the game so she hasn't really gotten close to anyone just friends with everyone crap. It is a smart choice to get Kaitlyn out because she is a strong competitor, but of course that isn't the reason the main alliance is gunning for her to go home. Just to be able to use Aaryn. I think I'm now rooting for Judd. Besides Amanda he seems like he's the only one that is actually is trying to play HIS game.